A 1965 Aston Martin DB5 Convertible sold for $1,184,000 as the top result at the Bonhams Aston Martin 2018 Sale in Reading, England. The top result at the annual Bonhams Aston Martin Sale was $1,184,000 paid for a 1965 Aston Martin DB5 Convertible. A 1964 Aston Martin DB5 Sport Saloon sold for $840,000. The annual Aston Martin Sale featured only Aston Martin cars and a range of related automobilia and spare parts. The annual Bonhams Aston Martin Sale was held in association with the Aston Martin Owners Club’s international concours d’elegance in the beautiful grounds of Englefield House in the heart of England on 2 June 2018. Enthusiasts from the USA, mainland Europe and the UK gathered to create a wonderful atmosphere on the beautifully manicured lawns with the 16th century stately home providing a stunning backdrop. The Bonhams sale realized a total of £4,474,499 with 90% of lots sold overall. One of the most celebrated Aston Martins is the DB5 and the sale saw two offered – a fixed head and a convertible. 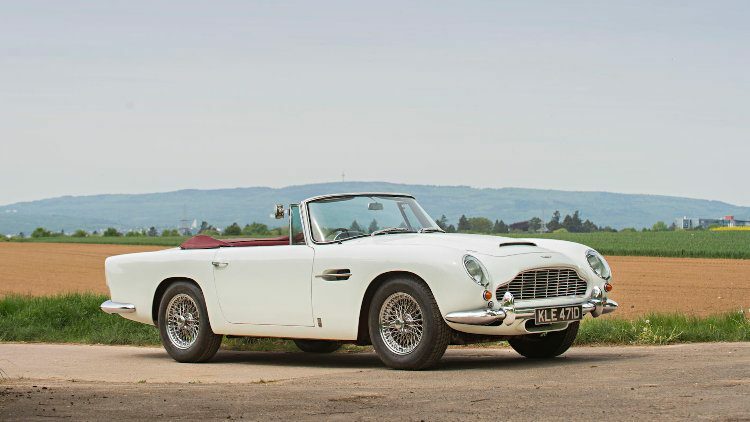 The elegant 1964 Aston Martin DB5 Sports Saloon sold for £628,700 to a bidder in the saleroom after a lengthy bidding exchange whereas the second, a 1965 Adton Martin DB5 Convertible, attracted attention from across the globe with bids coming in on the telephones, online and in the room. It eventually sold for £886,300 ($1,184,000) to a bidder in the saleroom. It wouldn’t be a Bonhams sale without a barn find, and a pair of projects that drew the attention of the assembled crowd were the 1951 Aston Martin DB2 Sports Saloon which achieved £66,460 and the 1954 Aston Martin DB 2/4 Mark II DHC, which had traveled all the way from Massachusetts. It realized £225,500, a testament to the enthusiasm that Aston Martin lovers still retain for exciting and rare projects. Further highlights of the sale included the ex-Jools Holland 1967 Aston Martin DB6 Mk1 Volante which sold for £494,300 and the eye-catching 1958 Aston Martin DB MkIII DHC which achieved £395,500. A day later, a 1965 Aston Martin DB5 Convertible sold for $1.45-million as the top result at the Bonhams Greenwich Concourse d’Elegance 2018 sale in Connecticut.